Are you looking for a new sleeping bag? And now you are overwhelmed by the number of options available out there? Then you have found yourself in the right place! Because here in this article we compare 8 of the best sleeping bags out there. And I’m sure that after reading this you will be one big step closer to choosing the best backpacking sleeping bag for your next trip! Yes, there are A LOT of options. There are different types and categories of sleeping bags. Sleeping bag fillings differ. And they also have different temperature ratings. The real trick here is to find one that is both as warm and lightweight as possible. Now let’s take a look at the list of the best backpacking sleeping bags! To read more about every one of them scroll down! For more photos, latest price and user reviews check them out on Amazon – just click on the name or image of the sleeping bag! There are a lot of different sleeping bags of different styles, and made of different materials. There is no one sleeping bag that is suitable for all weather conditions. There are extra lightweight summer sleeping bags and bags that will keep your warm in sub-zero temperatures. There are sleeping bags designed specifically for women. There are also doublewide sleeping bags. How do I choose the one for myself? Read on to learn more about sleeping bags! Mummy – cocoon-like sleeping bag with an added hood. This is the most popular sleeping bag design. The mummy bags are thermally-efficient and less bulky than rectangular sleeping bags. The mummy bags are wide at the shoulders, and narrow at the bottom. Such a design reduces the space and thus – air to be heated. Rectangular – simple sleeping bags without a hood. They’re designed to be used in warm weather. The cheapest rectangular sleeping bags can be used as indoor sleeping bags. Since this kind of sleeping bags don’t have hood person looses more warm air that with a mummy sleeping bag. Also rectangular sleeping bags are bulkier and heavier than mummy bags. However, they are roomier than mummy sleeping bags, with plenty of space for moving around. Double – two person sleeping bags. 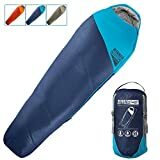 They are great for camping couples because this kind of sleeping bags eliminate the need to zip two sleeping bags together. Also the best double sleeping bags pack down smaller than two separate sleeping bags. The shells of sleeping bags are usually made of nylon. Some of the best backpacking sleeping bags are treated with water-resistant coating, or have coating on moisture-prone areas. Water resistant sleeping bags prevent condensation from getting in the bag. Please note, that sleeping bags aren’t entirely waterproof and can’t stay dry after a downpour. Take a tent with you if change of rain is high, or use bivy sack if you are a climber and have to camp in tight areas. Cheap, budget and even some mid-range sleeping bags are filled with synthetic insulation. Synthetic sleeping bags aren’t as lightweight and compressible as down sleeping bags. However, this kind of bags retain heat better when damp and dry quicker. Down sleeping bags are more expensive than synthetic sleeping bags, and they have a better warmth-to-weight ratio and provide excellent compressibility. If you are looking for a warm yet lightweight and packable sleeping bag, get yourself a down sleeping bag. Unfortunately, down isn’t water resistant. It will clump together when wet, and cease to insulate. However, there are some sleeping bags insulated with water-resistant down. Thanks to water-resistant treatment, this kind of down will stay dry much longer than untreated down. It also retains its loft and doesn’t cease to insulate when exposed to moisture. The upper limit is the highest temperature at which a “standard” adult man is able to have a comfortable night’s sleep without excess sweating. The comfort rating is based on a “standard” adult woman having a comfortable night’s sleep. The lower limit is based on the lowest temperature at which a “standard” adult man is deemed to be able to have a comfortable night’s sleep. The extreme rating is a survival only rating for a “standard” adult man. This is an extreme survival rating only and it is not advisable to rely on this rating for general use. However, some manufacturers don’t rate their sleeping bags. Still their temperature rating is realistic, and shows the lowest temperature at which it still will keep the average sleeper warm (or quite warm). Summer and 2 season 32 ºF and above For camping in summer and late spring / early autumn. With such a bag person will feel most comfortable in 40 - 50s ºF (4 - 10 ºC). (-12 ºC - 0 ºC) Versatile bags for camping in spring and autumn. Can be used also in summer. Winter 10 ºF and colder For cold weather camping and camping in snow. Women’s specific sleeping bags are designed to fit a woman’s body. This kind of sleeping bags are usually shorter than regular sleeping bags. Also circumference of the sleeping bag across the shoulders is smaller. Women’s specific sleeping bags feature more insulation in key areas. The best backpacking sleeping bags are packed with features that increase comfort and help maximize thermal efficiency. Snag-free zippers – zippers that won’t catch the sleeping bag material. Weight: 2.8 lbs (1.3 kg). Dimensions: 87” x 32” (221 x 81 cm). Fill: 200 g/m2 hollow fiber fill. Temperature rating: 35 – 40 °F (1.7 – 4.4 °C). The Winner Outfitters Mummy sleeping bag is perfect for those who travel on budget and can’t afford an expensive sleeping bag which, I must admit, can cost and arm and a leg. Yes, such bags are definitely worth all that money, but not everyone can afford those. 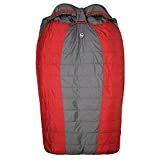 The Winner Outfitters Mummy sleeping bag is well made despite being so cheap, and it’s definitely among the best cheap sleeping bags available. However, it’s not designed for a very cold weather. This sleeping bag will keep you warm when temperature is not below 35 °F – 40 °F (1.7 °C – 4.4 °C). The shell of this sleeping bag is made of coated 350T polyester, and the lining is made of 350T polyester which is skin-friendly and soft. The Winner Outfitters Mummy sleeping bag is a cocoon-like sleeping bag with an added hood. Because of the additional head coverage you’ll feel warmer than in a square sleeping bag. The sleeping bag features a draft collar which can be tightened with a drawstring. It will prevent warm air from escaping when you move around at night. The zipper is dual, and goes down 2/3 of the way. It it becomes to warm you can unzip the bottom part of the zipper a bit to let the warm air out. The Winner Outfitters Mummy sleeping bag comes with two sacks: a soft stuff sack and a compression sack with compression straps and a handle. It’s not that easy to put the sleeping bag into the compression sack, and when placed in a soft stuff sack, it’s quite bulky. Weight: regular – 3 lbs (1.36 kg) / long – 3 lbs 3 oz. (1.45 kg). Size: regular – 6 ft (183 cm); long – 6 ft 6 in. (198 cm). Fill: ThermaPro™ Insulation (synthetic fiber blend). Temperature rating: 22 °F (-5.6 °C). The Kelty Tuck 22 is a great choice for camping in spring, summer and fall. The EN comfort rating is 33 degrees Fahrenheit (0.6 °C) and lower limit rating is 22 degrees Fahrenheit (-5.6 °C). The Kelty Tuck 22 is a synthetic mummy bag that has ThermaPro synthetic insulation which is a fiber blend specifically engineered to retain warmth. The shell and the lining of the sleeping bag is made of 75D Polyester Taffeta fabric. The sleeping bag features a Thermal-comfort hood with dual drawcords and draft collar, natural fit foot-box that can be unzipped, zipper draft tube and media-integrated storage pocket. Available in two sizes: long and regular. Women’s specific 20 degree version available, too. Zipper gets caught on the draft tube if you are not careful. Weight: regular – 2 lb 7 oz (1.10 kg), long – 2 lb 10 oz (1.19 kg). Size: regular – 78” (198 cm), long – 84” (213 cm). Fill: synthetic, with Thermal.Q™ 100 g/m2 insulation. Temperature rating: 21 °F (-6 °C). The Mountain Hardwear HyperLamina Flame 20 is one of the lightest and warmest synthetic sleeping bags available. Its ultralight shell is soft and highly wind resistant. The most important thing – the Mountain Hardwear HyperLamina Flame 20 sleeping bag retains warmth even when damp. This sleeping bag is designed to maximize thermal efficiency. By mapping different insulation weights throughout the top of the bag the manufacturer has been able to concentrate warmth where a person needs it most – around their core and feet. Thermal.Q insulation eliminates the cold spots caused by traditional stitching. Sleeping bag’s ergonomic draft collar keeps warm air trapped inside. The Mountain Hardwear HyperLamina Flame 20 sleeping bag has a somewhat interesting design – sleeping bag’s zipper is located in the middle of the sleeping bag and extends only half way down. Such a design is perfect for cold weather, as it helps trap the warm air. The sleeping bag is made of 22D Tactel Nylon Dobby. The EN comfort rating is 32 degrees Fahrenheit (0 °C) and lower limit rating is 21 degrees Fahrenheit (-6 °C). The Mountain Hardwear HyperLamina Flame 20 comes with a compression sack and a stuff sack. Very warm yet light enough. It might not be the best option for warmer weather because of the zipper. It only goes halfway down, and it’s located at the front of the bag. You won’t be able to open it a lot, or, for instance, to put your foot our if it becomes too warm. Weight: 1 lb 2 oz (510 g) – 1 lb 5 oz (595 g). Size: small – 5 ft 6 in (165 cm), regular – 6 ft (183 cm), long – 6 ft 6 in (200 cm). Temperature rating: 32 °F (0 °C). At just 1 lb 3 oz (540 g), the SummerLite is the lightest sleeping bag on this list! Is the SummerLite best backpacking sleeping bag? Well, if you are looking for a lightweight sleeping bag for summer, look no further! You’ll feel so comfortable and warm in the SummerLite bag that you won’t want to leave your tent in the morning! Actually the Western Mountaineering Summerlite 32 is a 3 season sleeping bag but some people might get too cold in this sleeping bag during late autumn or early spring. Of course, it depends on location. The Western Mountaineering Summerlite sleeping bag has a simple design yet there are a couple of great features! This compact sleeping bag packs down to a 12” x 6” (30 x 15 cm) bundle. The SummerLite sleeping bag comes in a stuff sack. Very lightweight and compact, yet warm enough to camp in warm and mid-temperatures. The full length zipper allows you to open it up down to the footbox. Might be a little narrow for a larger person. Weight: 1 lb 14 oz – 2 lb 2 oz (850 – 965 g). Size: small – 5’6ʺ (165 cm), regular – 6’0ʺ (183 cm), long – 6’6ʺ (200 cm). Temperature rating: 10° F (-12 °C). Excellent sleeping bag perfect for late autumn and mild winter! Its full draft collar seals in the warmth and will protect you from the cold. 850-fill down insulation retains body’s warmth and provides a high warmth to weight ration and excellent compressibility. The Western Mountaineering Versalite sleeping bag is made of quality materials, and it’s one of the lightest bags in its class. Also it’s among the top rated sleeping bags on the market. 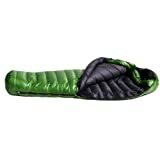 The shell of this sleeping bag is made of water resistant 2 denier ExtemeLite fabric, and the lining is nylon taffeta. The sleeping bag features full-length, snag-free zipper with full-length draft tube that stops cold air from entering through the zipper. Wider shoulder girth allows for extra layering in very cold weather. The Western Mountaineering Versalite sleeping bag comes with a storage sack and a stuff sack. Not designed for a petite female, since even the small bag is too wide. Weight: regular – 2.9 lbs. (1.3 kg), long – 3.1 lbs. (1.4 kg). Size: regular – 6 ft (183 cm), long – 6 ft 7 in (201 cm). Is the North Face Inferno 0 the best sleeping bag? This extra warm sleeping bag is the perfect choice for camping in winter and sub zero temperatures! Also it’s great for trekking and camping in the mountains. It’s a good choice for Annapurna circuit trek and Everest Base Camp trek during the fall or early spring. The North Face Inferno 0 is insulated with water-repellent 800-fill ProDown and constructed with a wider, roomier cut which allows room to wear more layers or to shift about in the bag. This sleeping bag has several cool features. Full draft collar and integrated draft overlap help prevent heat loss, and trapezoidal side baffle prevents down migration. Water-resistant Neovent Air fabric on hood, footbox and back protects moisture-prone areas. There’s also an internal pocket for insulated storage. The North Face Inferno 0 comes with a storage sack and a compression sack. 800-fill ProDown is enhanced with a hydrophobic finish that repels moisture and allows the bag to dry faster. Not suitable for warmer weather because of its center zipper. You won’t be able to open it much. Weight: 2 lbs 6 oz (1085 g). Size: 5.5 ft (168 cm). Temperature rating: 15° F (-9 °C). In my opinion the Marmot Xenon 15 is the best backpacking sleeping bag for a woman. Weighting just 2 lbs 6 oz it’s surprisingly warm and comfy. Because it’s so warm it’s the perfect sleeping bag for a long-distance hike, such as the PCT. This sleeping bag will ensure comfort on cold nights. The Marmot Women’s Xenon is a mummy sleeping bag with a warm drawstring hood and a full-length two way zipper. The shell of this sleeping bag is made of Pertex (20D nylon ripstop), with DWR coating. And the lining of the sleeping bag is made of 30D nylon, also coated with DWR coating. The Marmot Xenon sleeping bag adds insulation where women need it most for warmth down to 15 °F (-9 °C). It features an anatomically designed footbox with wrap-around construction that increases warmth. Smooth-curved baffles reduce down shifting and Nautilus Multi-Baffle hood limits heat loss. The sleeping bag features also a snag-less insulated draft tube. The Marmot Women’s Xenon sleeping bag comes with a stuff sack and a storage sack. Designed to maximize thermal efficiency. Might not be the best option for petite women. Weight: 4 lb 2 oz (1.87 kg). Size: 6 ft (183 cm). Fill: synthetic, Hotstream® by Insotect insulation. Temperature rating: 30 °F (-1 °C). The Big Agnes Big Creek sleeping bag is designed for two people, and it eliminates the need to zip two sleeping bags together. 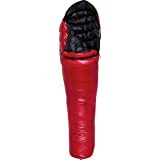 It’s one of the top rated sleeping bags for two people. The sleeping bag is designed for maximum comfort. It features pillow sleeves and integrated sleeping pad coupler that can accept a double pad or two single pads side by side. Thanks to the stretch fabric panels on the side of the pad sleeve, the pad sleeve can accommodate sleeping pads of different thicknesses. Also the bag has a free range hood that gives you the freedom to lift your head while snuggled in the hood. You can attach the top of the body of the sleeping bag to the center of the hood with a fabric flap. It helps keep warm air trapped inside the sleeping bag. Double zippers allow entry from either side of the sleeping bag, and when unzipped, you can use the sleeping bag like a blanket. The shell of the Big Agnes Big Creek sleeping bag is made of nylon rip-stop fabric with a water repellent finish. The sleeping bag has a nylon taffeta lining. The sleeping bag features Hotstream® by Insotect insulation which is 100% recycled polyester insulation. The Big Agnes Big Creek comes with a mesh storage sack and nylon stuff sack. This two person sleeping bag packs down smaller than two separate sleeping bags. Can be used as a blanket. Despite the fabric flap closure some warm air still escapes this sleeping bag because of the gaps between the two people.